1. A father’s love or lack thereof for his daughters in comparison to male ward. As a decent human being and lover of equality, Sydney’s father, Jared Sage, really pissed me off especially in how he treated Sydney in comparison with Keith. Yes, I can understand possibly being able to identify more when it comes father to son (male ward), but Sydney is his daughter. She’s intelligent, knows what she’s doing, and has seen her way around the Moroi world. But her father not only played favorites, it was mostly based on discrimination of gender, which really angered me. I respect Mead for making this choice, because it has enhanced Sydney’s character, but his character still made me mad. Even back in Vampire Academy, readers knew that Sydney barely ate anything. In this series, it comes out that she is very nearly an anorexic. She rarely eats because she thinks that her already tiny body should be even tinier. Adrian makes comments that what she does isn’t healthy, and even in the second book has almost a full-on intervention. Sydney’s desire to look like a Moroi is so impossible, for obvious reasons, but to have even other Moroi think that she is beautiful and would be healthier if she put on more weight is actually something that makes me very happy. Mead puts little things like this in her writing that make me love her. This is most definitely one of them. 3. Jill Mastrano is not how I remembered her. I remembered Jill being a little fangirl, sweet, fun, cute, and a lovely person. In this book she is so whiney. I hated when she had scenes in the book. I’m not sure if it was because I really hated the fashion show side story or what, but I hated how whiney Jill is. Like, doesn’t she get that all of these people gave up their lives to keep her safe? And what does she give them in return? 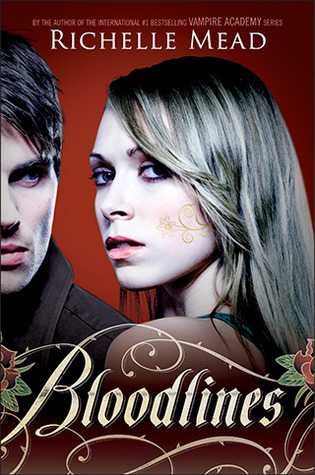 Overall, I thought that this was probably the worst book Mead has come out with among the Vampire Academy/ Bloodlines series. Not great writing, characters seemed off, and the plot was just ‘meh’. It didn’t stop me from reading the rest of the series just because I knew it had to get better than this. And for obvious reasons, I love Adrian and I wanted to know what kind of role he had in this series. I gave this book 2 stars on my Goodreads.